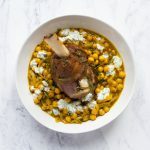 Lamb shanks are slow cooked in a casserole pot alongside a simple spiced chickpea stew. Everything cooks together allowing the flavours to combine – producing a wonderfully comforting meal – perfect for those cooler evenings. Mix the marinade ingredients together in a mixing bowl. Add in the lamb shanks and rub in the marinade. Cover and leave to marinade to between 1-12 hours. The longer the better. Preheat your oven to 160 degrees Celsius (320 degrees Fahrenheit). Heat an ovenproof casserole pot oven over a medium-high heat with a tablespoon of oil. Add the lamb shanks and brown them on all sides. Then remove them to a plate. Wipe the casserole pot with a piece of kitchen paper. Add another tablespoon of oil to the casserole pot and heat to medium-low. Then add the mustard seeds to the pot and fry for 1 minute or until they begin to pop. Then add the turmeric, coriander, cinnamon and dried chilli flakes. Fry for 30 seconds. Add the onions to the pot and cook for 2-3 minutes until they begin to soften. Add the garlic and fry for 1 minute. Pour in the chickpeas along with the water. Stir to combine everything. Nestle the lamb shanks in the pot in amongst the chickpeas and onions. Put a lid on the pot and pop it in the oven for 2 hours. After 2 hours remove the lid from the pot and leave the lamb shanks and stew in the oven for a further 30 minutes to allow the lamb shanks to brown and some of the liquid to reduce. Prepare the mint yoghurt by combing the yoghurt, mint, lemon juice and salt and pepper in a bowl. Set aside until ready to serve. Remove the casserole pot from the oven. Add the salt, pepper and lemon juice to taste. Serve the chickpea stew in bowls with a lamb shank on top and a drizzle of mint yoghurt. Enjoy!